Thailand's police chief has warned anyone speculating on social media about the murder of two UK tourists could face up to five years in jail. General Somyot Pumpunmuang issued the warning as criticism mounts over the way police have handled the case. Two Burmese migrant workers charged with the murders of David Miller, 24, and Hannah Witheridge, 23, say they were tortured into confessions. Police insist their investigation has been thorough and professional. 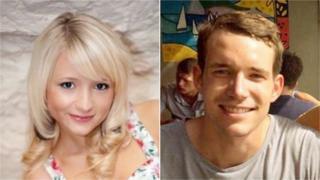 The bodies of Ms Witheridge, 23, from Norfolk and Mr Miller, 24, from Jersey, were found with severe head injuries on a beach in Koh Tao on 15 September. Burmese men Zaw Lin and Win Zaw Htun both face the death penalty if found guilty, but Mr Zaw's mother said the case was "fixed". Speaking at police headquarters in Bangkok, General Somyot Pumpunmuang threatened to use one of Thailand's toughest laws - the Computer Crimes Act - to prosecute anyone caught speculating about the murders on social websites. There has been some speculation about the alleged involvement of Warot Tuwichien, 22, the son of local village chief Woraphan Tuwichien. Mr Warot, who says he was in Bangkok at the time, appeared in front of the media alongside police and his father to give a DNA sample. It will be compared with samples taken from the victims' bodies, but Gen Somyot said this will not affect the investigation, which was now closed. Prime Minister David Cameron and the Foreign Office have already expressed concerns about the investigation. After initial resistance from Thailand's military ruler Prayuth Chan-Ocha, a team of UK police officers arrived last week to observe the proceedings, but cannot be involved involved in the investigation without an invitation from the Thais. An online petition calling for an independent investigation into the murders has attracted over 100,000 signatures.